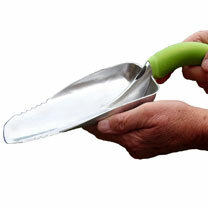 This extra-wide scooping trowel features a wide, sharp front blade great for shallow digging or scooping large volumes of material from the ground or bags. The serrated edges will cut through roots or easily open bagged material. Ideal for hand trimming beds or raised and container gardening.